Its Almonte in the winter! I took this picture on the way back from dropping Peter off this morning. 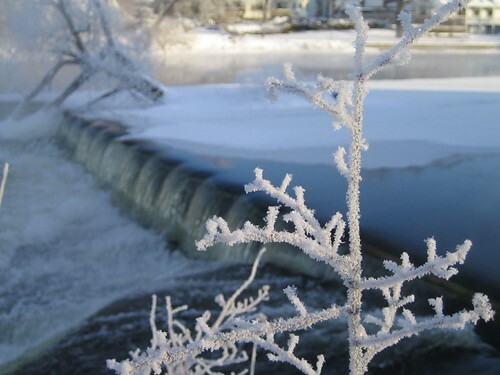 The whole downtown of Almonte is covered in frost – so pretty. And cold: -24 with the wind chill this morning! Gross. Worth it though. ANYhoo! This recipe is always a hit. Basically because you can wrap anything in bacon and people will devour it. A Kenora holiday favourite! Remind me to get some stretchy-waistband pants before I go home this year. This recipe is from the Pellatt Community Cookbook, circa 2002. I am getting some good mileage out of this cookbook. Cut bacon strips in half or thirds. Wrap around water chestnuts and secure with toothpick. Place on cookie sheet and bake in 350 degree F oven until bacon is done, not crispy. Boil the ketchup, OJ, sugar and soya sauce until sugar is dissolved. Serve with copious amounts of red wine to keep your blood thin enough to get through your arteries. : ) ENJOY!